Sharing takes on a different meaning here. 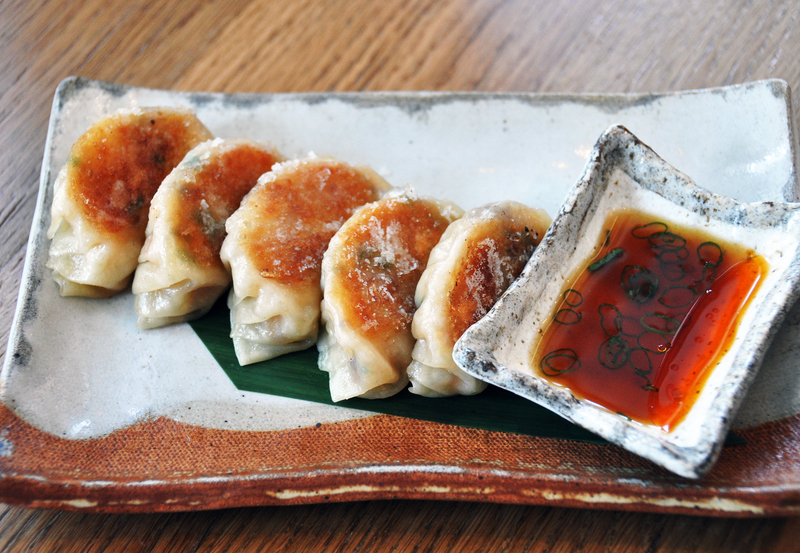 Zuma’s Izakaya concept means that each diner partakes of all the offerings on the table and leaves more than satisfied. This restaurant is situated at the edge of Brickell Avenue, overlooking the Miami River. It features indoor & outdoor seating, an open robata grill kitchen and a sushi bar. It has quite a unique atmosphere…the first time I entered this place I thought that the decor was the epitome of a contemporary and sophisticated food destination. They specialize in modern Japanese cuisine served “izakaya” style which means that food items are usually shared by everyone at the table. I was with Mr. H, my infamous dining companion, and we decided to have a mini-feast. We ordered the rock shrimp tempura with lime and chile mayonnaise (ebi no tempura), the edamame steamed soybeans with sea salt plus the kuruma Eebi no tempura tiger prawns as an appetizers, followed by a mixed leaf salad and pork loin from the robata grill. 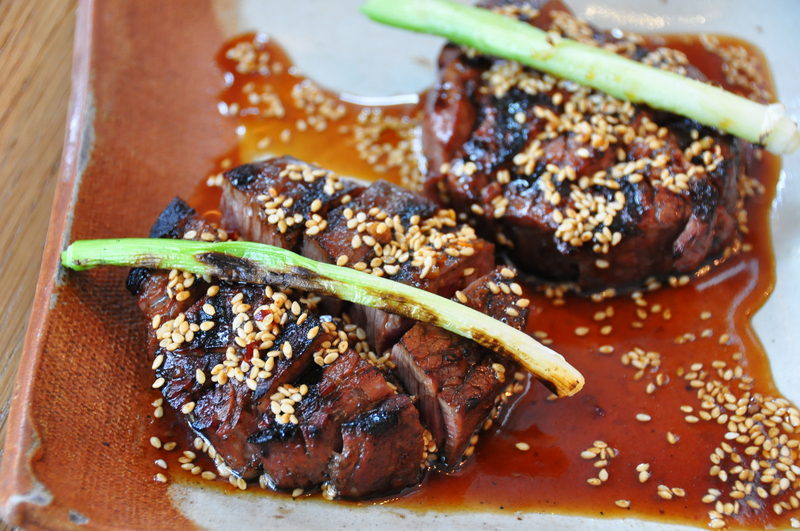 We also indulged in the spicy beef tenderloin with sesame, red chili and sweet soy and desserts. We were not little gluttons for ordering all these dishes as it was not an ordinary day: It was Mr. H.’s birthday. We had to celebrate this occasion in style. 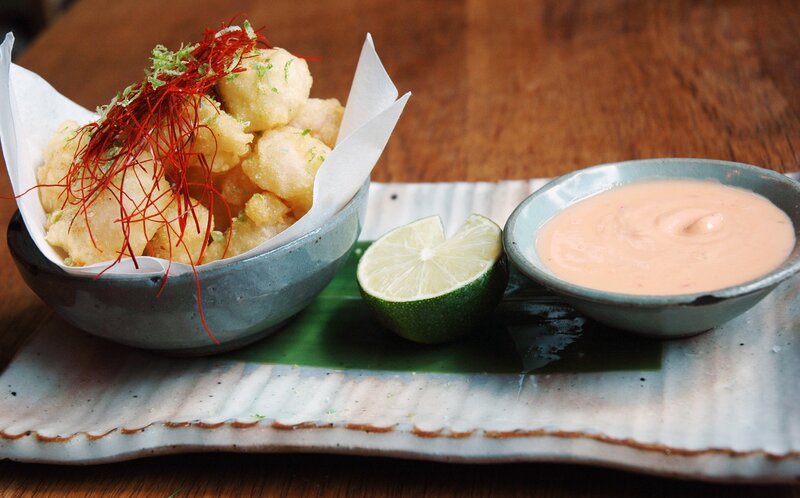 While gazing out the window at the boats cruising the Miami River, the rock shrimp tempura arrived. They looked and smelled fantastic. The tempura was hot, hot, hot and tender, each bite igniting a volcanic explosion of flavor in my mouth. I had never tasted anything like this before. Definitely the best tempura I have ever had, in my life. 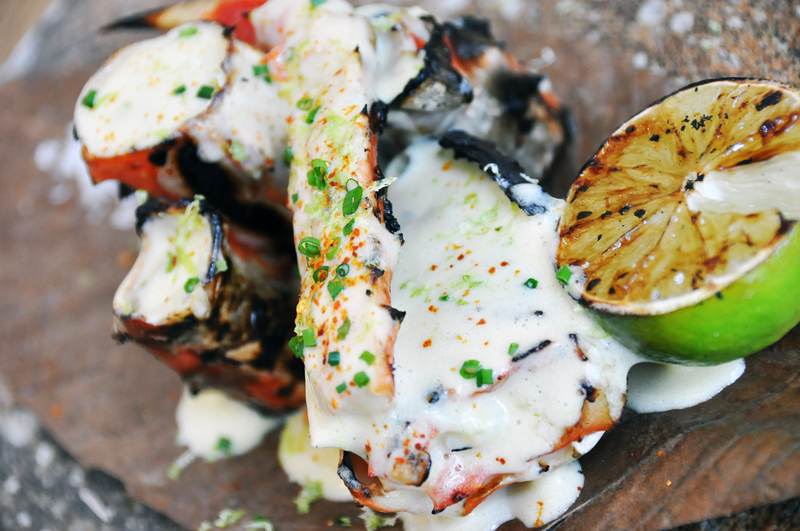 It was served with a tantalizing chile mayonnaise that helped cool down the tongue. 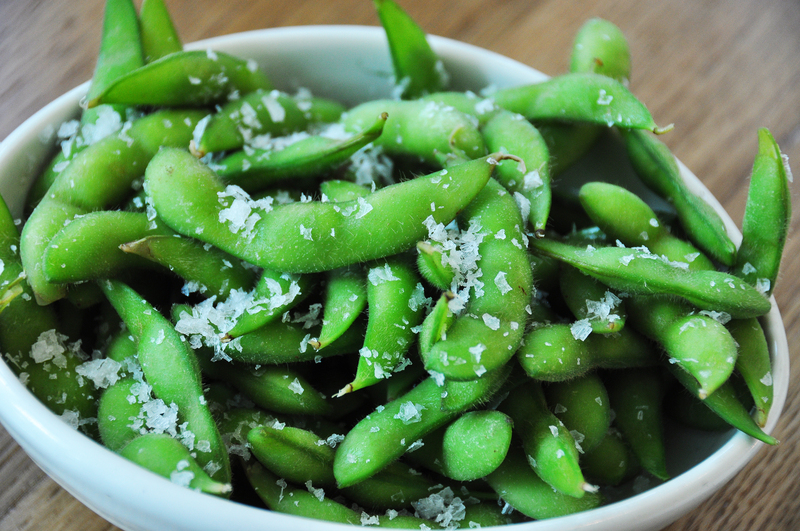 This was followed by the more gentle edamame which was crispy, warm and deliciously salty because of the giant bits of sea salt sprinkled throughout. Then came a dish with the most unusual presentation, kuruma Eebi no tempura tiger prawns. I was so fascinated with it that I almost did not get to taste it: the tempura was presented in a “boat” that consisted of a shellfish head resembling a dinosaur! When I actually did put a piece of tiger prawn tempura in my mouth, I was soothed by a warm and gentle feeling of happiness…wow, is all I could say. Other appetizers also followed; all delicious and delivering flavor-bombs with each bite. Next we had the salad and what a salad this was. 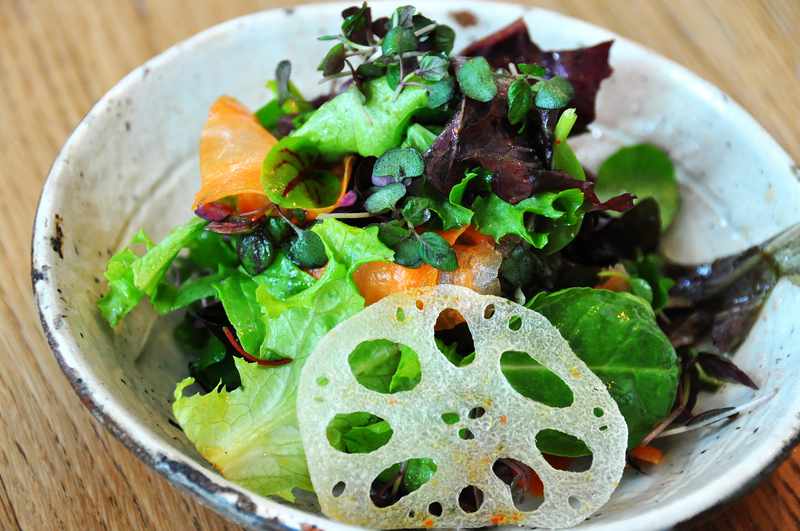 Micro greens and shaved carrots and asparagus served with a maple shichimi dressing. It was a beautiful salad, delicate but rich in flavors and a hint of sweetness because of the maple in the dressing. Then it was the pork loin’s turn. 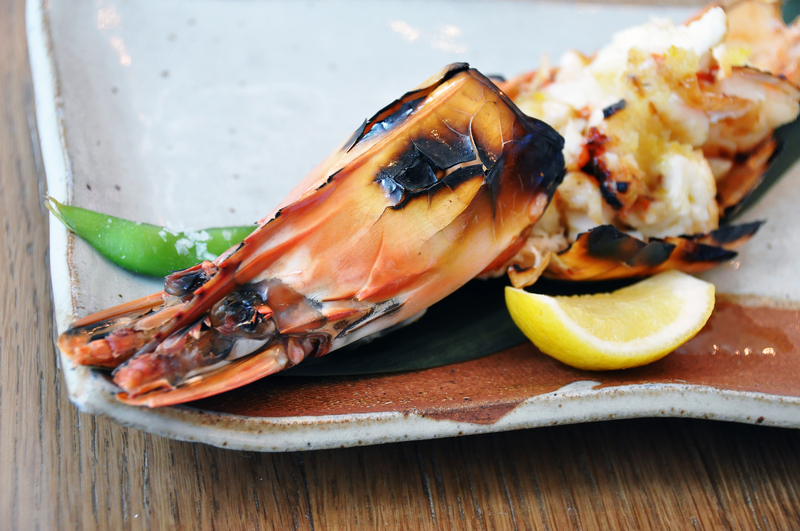 It was cooked on a robata grill which is an ancient type of Japanese grilling for cooking food in front of customers. I was not sitting by the grill so I witnessed the process from afar. We had to wait for this dish for a long time. It was the special of the day and it took an eternity to get to the table. Eventually it arrived served with a miso-wasabi sauce and kimchi. It was quite a revelation as far as flavor and texture is concerned. It was served on a pandan leaf, beautifully charred from the grill on the outside and so very juicy and fork tender on the inside. The sauce enhanced the pork very nicely. Kimchi, which are fermented vegetables, is still a flavor I have to get used too. The kimchi was interesting and intense but still not my favorite yet. My favorite by miles was the beef tenderloin. I cannot be objective when it comes to rare beef as I adore when it is cooked this way. The addition of the sweet soy, sesame seed and that charred green onion sitting atop the steak almost made me swoon. The desserts were also not ordinary. 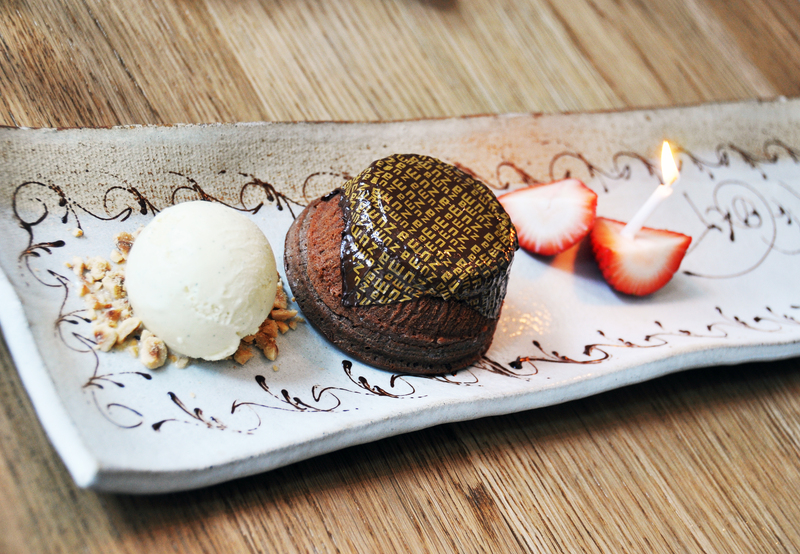 The chocolate cake came topped with edible chocolate paper. The secret underneath this “paper” was a lava of hot chocolate sauce. Two surprises on one plate …The next dessert was the Coconut Yukidama. I am not even sure how to describe this dessert so I will not even try. 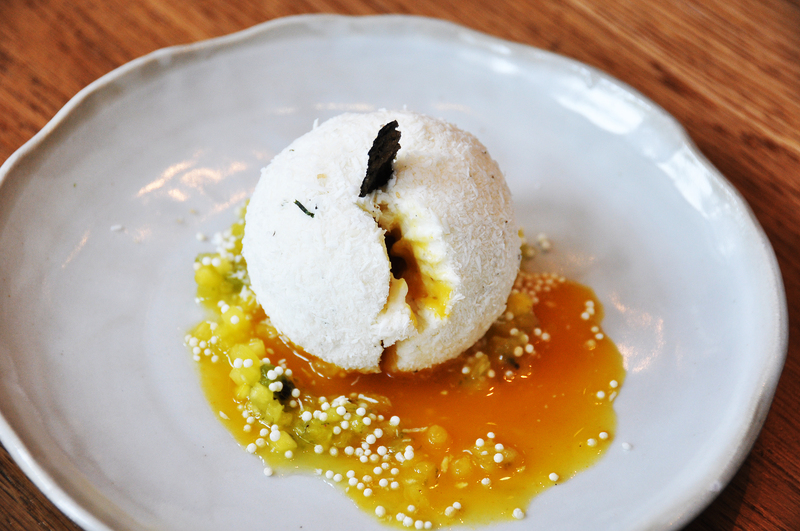 It was basically ice cream, rolled in coconut flakes and filled with a fruit sauce which I could not identify. Who cares what it had in it? It was divine, I assure you. I have to mention that the service was above the ordinary, the waiter even gave us a special chair for our cameras and that was very thoughtful. A lovely gesture. 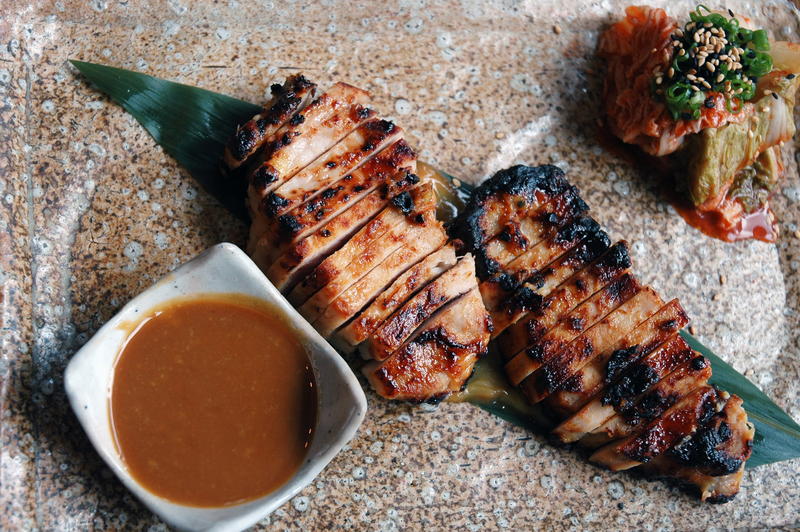 The only thing was how long the pork loin robata seems to always take to get to the table. One drawback I observed in this restaurant is that the prices can be quite steep even without wine or drinks. The best bet would be the the “Zuma set lunch” which is $24 per person and includes a main dish, steamed rice, white miso soup and a mixed leaf salad. If you plan on going for dinner, visit your banker first to make sure that you have enough funds! Zuma has locations in London, Hong Kong, Istanbul and Dubai. Thank goodness they decided to grace us with their presence in Miami. I will be back….as soon as I win the lottery, marry rich or just throw all caution to the wind and just decide to enjoy the feast.